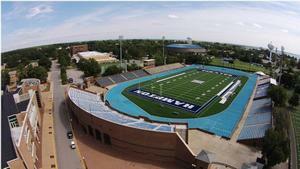 HAMPTON, Va. (Dec. 6, 2018) — Hampton University’s Armstrong Stadium will be host to the 2018 Virginia High School League (VHSL) Group 5 and 6 Football State Championships, Saturday, Dec. 8 at noon and 4:30 p.m., respectively. Gates will open to the general public at 10:30am. All game tickets will be $10. Children six and under will be admitted free with a parent. Tickets can also be purchased online at vhsl.org. Parking Lots 2, 10, 21 and 41 will be used for general public parking at a cost of $5. The Group 5 championship game will feature Highland Springs (14-0) vs. Stone Bridge (12-2) at noon. The Group 6 championship game will feature Manchester (14-0) vs. Freedom (13-1) at 4:30 p.m. Initially constructed in 1928 by William E. Lee, a graduate of Hampton's Building and Construction Program, Armstrong Stadium is one of the finest football venues in the region. Under the administration of Dr. Harvey, renovations include new press boxes over both stadium sides, improved bleachers, stadium lights, a modern track surface, TV towers , ready rooms, and, most recently, a state-of-the art Daktronics LED Visual Display HI-Def Jumbotron and Sport Sound 2000 HD Sound System in the South end zone; a traditional score board is installed in the North end zone. In addition, Armstrong Stadium has nine offices, a conference room, three multipurpose audio/visual team rooms (offense/defense/team), a locker room, a reception and waiting areas and a team lounge. Armstrong Stadium holds 12,000 fans for football, track and field, and other large outdoor events. VHSL has conducted football championships since 1920, when Newport News High School defeated Jefferson Senior High School of Roanoke, 14-7, in VHSL's first title football game. A six-division format and power-ratings system were put into place in 1986 to promote more equitable competition between similarly sized schools.